The critically-acclaimed book “Your Water Footprint” reveals how water is essential to our civilization in ways we never imagined. While water usage continues to soar, shortages now affect more than 3 billion people including millions of Americans and Canadians. A decade from now 3 out of 5 people will face water shortages. 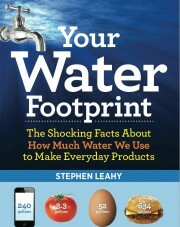 Voted Best Science Book for it’s clarity, relevance and powerful infographics, Your Water Footprint provides essential information on how to reduce your water use. That will help you save money, be prepared for shortages and ensure our children and grandchildren will have abundant fresh water. Water-wise choices is all about smart substitutions and changes, rather than sacrifice and self-denial. Can you give me more details about your talk at the Brickworks on July 4, and any other upcoming talks? A stunning book that has truly opened my eyes to how we are living and the impacts it is having on water – and life itself!